The Savile Row Tailor in Washington D.C.
On the 1st of May 2013 we moved just a stones throw from my previous location here in Mayfair next door to the famous Sotheby’s auction house. 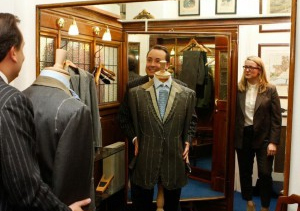 It would allow myself and Celia to work together and ensure that the soft tailoring craftsmanship is in safe hands, after my Father John Hitchcock retired from the trade in August 2014. © 2019 Copyright The Savile Row Tailor.